What to do on a rainy Sunday afternoon? Why not discover a museum on the other side of the world virtually or visit a museum in reality and dive into the provided virtual experiences? Not only are there already a lot of examples existing for VR and museums, but they also follow different approaches. From preservation of objects and heritage sites, to accessibility and educational purposes to the provision of new experiences. We picked a few examples to give you an idea about the different fields of applications (they are often overlapping) of VR and museums. The Museum of Modern Art in New York (MOMA) is featuring VR in an exhibit for its film and cinema wing. 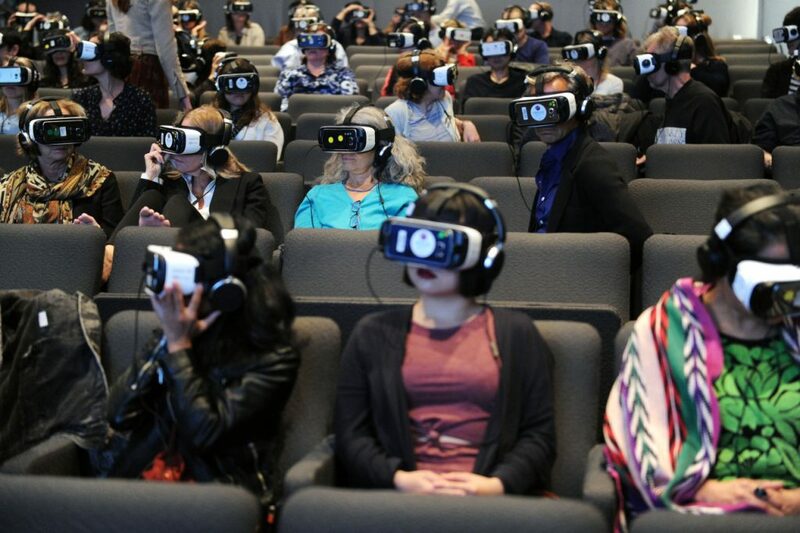 For Raj Roy (curator of MOMA’s film exhibits), the audience’s potential reactions were the driving force behind the idea of a VR installation. The exhibit was constructed as a collective VR experience that allowed 100 visitors to immerse themselves into the videos. The exhibition is the first VR installation at MOMA (started in April 2016) and showcases the best of the Sundance Film Festival’s New Frontier program. One of the projects is Collisions, it explores the collision of science and spirit. “Collisions is a virtual reality journey to the land of indigenous elder Nyarri Morgan and the Martu tribe in the remote Western Australian desert.” The content of the exhibition is art, and the VR technology is considered as the platform for that creative expression. “Technology is critical in propelling artistic innovation.” Raj Roy believes that VR could have a big impact on the MOMA. Last summer, the British Museum hosted a VR weekend. The museum has been partnering with Samsung since 2009 and they created the Samsung Digital Discovery Centre, which has the mission “to enable children to bring the world’s history and cultures to life through advanced technology, using the latest Samsung digital equipment.” The exhibition in August 2015 was based on the British Museum’s collection and gave visitors a new way to interact with the collection. VR has a specific role to help people understand historic objects in the original context. With HMDs, visitors could see 3D scans of objects from the Bronze Age (two unique interlinked gold bracelets), placed in their original setting. Viewers could explore multiple interpretations of how the objects might have been used in the past. In this paper you can find more information about this project and some general background about VR and museums. The National History Museum took “visitors on a 3D journey to see some of the Earth’s earliest inhabitants”. David Attenborough guided the viewers through the VR experience, where he travels back in time. ‘First Life’ VR experience allowed users to immerse themselves for 15 minutes into ancient oceans. Using VR, sea creatures that existed more than 500 million years ago are brought back to life. This application of VR in museums provides an opportunity to discover the natural world and its historic development in a new way. Michael Dixon (director of the museum) is convinced that technology can change the way how museums and their collections are experienced. ‘First Life’ is not available anymore, but visitors can already book their tickets for the upcoming VR experience with David Attenborough: ‘Great Barrier Reef Dive’. The VR experience combines the Museum’s research with 3D technology, vividly presenting the reef’s colourful corals and darting shoals of tropical fish. WoofbertVR is an app that gives people the opportunity to experience “art. virtually. anywhere.” The app lets you discover The Courtauld Gallery in London from your home. The aim of WoofbertVR is to provide access to the arts and offer an innovative and engaging educational content. They are planning to release new experiences constantly (every 4-6 weeks) that allow the viewers to immerse themselves in museums, architecture or cultural heritage sites from anywhere, at any time. An important target group is seen in scholars, providing them a new way of studying. By “bringing a picture to life”, the app allows the user to step inside a painting from the year 1882. It provides a possibility to look at cultural, historical and philosophical aspects from a different angle. The vision of the team behind WoofbertVR is to put the user in the center, the user should be able to choose when to learn about what and how from wherever he/she wants to do so. They see the future of VR and museums in a massive platform of arts, institutions architectural and cultural sites that are all interlinked in some way. Europeana is a project by the European Commission and that approaches the vision of Woofbert. Europeana focuses on the preservation of art and is an online platform that provides digital art objects. By now, the platform has an inventory of 53,076,459 artworks, artefacts, books, videos and sounds from across Europe that can be digitally discovered and around 1,500 institutions contribute to the collection. In 2013, they released a video about how they see the ‘Museum of the Future‘. It was planned to provide virtual museums that can be discovered with HMDs, so everybody can look around museums and heritage sites from home. “Virtual reality will offer great opportunities for the world of museums, galleries and archives”. They developed a fictional museum (‘EUseum’) that showcased masterpieces from the Dutch Rijksmuseum. With an Oculus Rift it was possible to virtually walk around and look at paintings from much closer than it would be possible in reality. Unfortunately, we could not find any up to date information about the VR experiences. We downloaded the corresponding app, which gives you the opportunity to navigate through a museum and look at some digital art objects, but not in the meaning of VR. As a side note it can be added that most of the museums use Samsung Gear VR for the virtual discoveries and museums such as the British Museum or the National History Museum restricted the use of the VR experiences to visitors aged 13 or older. These were only a few examples and of course there are many more use cases of VR and museums, but mentioning all of them would definitely go beyond the scope of a blog post. For more general information about museums in the digital world we recommend the video by the Financial Times.